A Halloween Gift Basket is a good gift idea! Last year me and my boyfriend wanted to do something for our friends for Halloween because they weren't doing so good. We went to Wal-mart and bought a wicker basket, three scary movies, a blanket, some candy, and some candles. When we got home, we wrapped it in fake spider webbing and gave it to them so they could have a spooky movie night. They loved it! That is a very clever idea, Sara. Thanks for sharing it here. 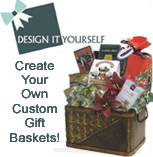 If you aren't able to make the gift basket up yourself, or you want to send one to someone who doesn't live close the perfect solution is Design It Yourself Gift Baskets. They have a huge selection for all different tastes or, as the name suggests, you can 'design it yourself' selecting just what you want to be included! They offer free shipping, too, so that's an extra savings that you won't find most places. Go ahead and spoil someone. They'll love it!